The Council are consulting on changes to the NSP Submission version between January and May 2019. Deadline for comments is 17th May 2019. These are the policies being amended and SPN is preparing templates on each of these. If you want to see any of them, email info@peckhamvision.org. April 2019 SPN training group is preparing information in the form of templates for SPN on the issues to think about and the representations to make about the soundness of the NSP in the light of the proposed amendments. January 2019 The Council are consulting on changes to the NSP between January and May 2019. Deadline for comments is 17th May 2019. SPN is developing guidance on the issues and the way to make representations following the SPN meeting on 11th February 2019. Further information will be posted on this page. If you wish to contribute to this please email info@peckhamvision.org to seek more information. December 2018 Some SPN members met with Cllr Johnson Situ (Planning and Regeneration) and Cllr Leo Pollak (Social Housing) for an informal discussion about the way to increase substantially the social housing in the borough. This note about the issues was provided by the SPN members as a basis for the discussion. September 2018 The submission of the NSP before the elections did not happen. It is now expected to be submitted in 2019. SPN has asked Cllr Johnson Situ new Cabinet Member for Planning and Development to publish information on the representations it received. This would have been done already under the original time table. April 2018 SPN organised a community hustings in April during the local Council elections. This created the opportunity for a first borough wide discussion of significant issues raised by the NSP. An election hustings on planning and regeneration was arranged for Saturday 14th April 2.30pm-5pm by the Southwark Planning Network in the lead up to the local Council elections on 3rd May. This was a community-led meeting, and a community exhibition on planning issues from the neighbourhoods across the borough. It was at Christ Church at 676-680 Old Kent Road, near Commercial Way. Email info@peckhamvision.org to get involved. The stream of tweets on @ShapeSouthwark gives a good account of the debate as it unfolded. The Questions asked & themes of debate are here. The consultation ended on 27th February 2018. The council will now collate the comments and submit them to the Government along with the new Southwark Plan. Some community comments on the main issues will be uploaded here in due course, and highlighted for the Council elections. The Council intends to submit the NSP to the Government before the local elections in May 2018. 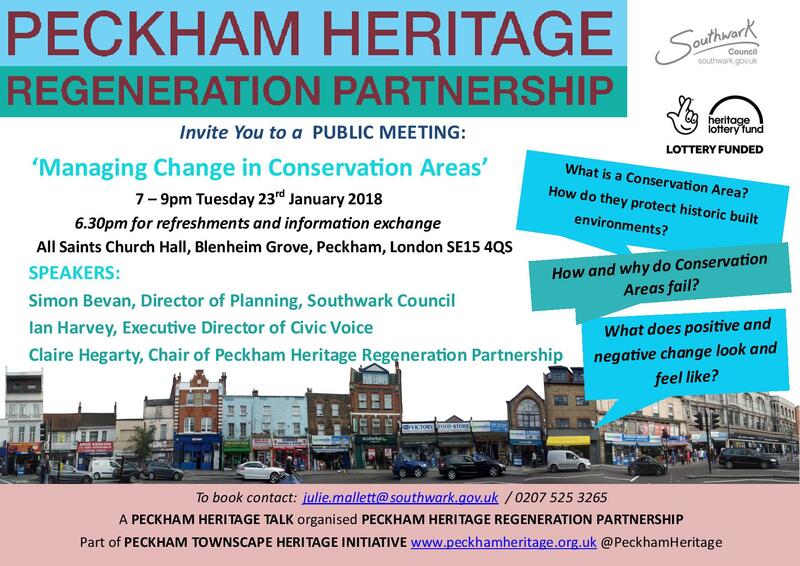 This page is compiled by Peckham Vision through the work in coordinating Southwark Planning Network (SPN). The New Southwark Plan (NSP) which is out for consultation, until Tuesday 27th February 2018, is the final version from the Council. They aim to submit it without changes to the Government in April for the Examination in Public (EiP) sometime between June and possibly November 2018. You can see a copy here. You can get a paper copy by mailing - planningpolicy@southwark.gov.uk - and arranging to pick it up at Tooley Street or asking them if they will post it. There are also copies available in Libraries for reference. For more on the information on this page, and how to get involved, email: southwarkplanningnetwork@gmail.com More Council information on the NSP plus the borough map with many improtant details click here. an individual site template. Click here to find your area’s sites. copy and paste or summarise or select any reasons from the template if you wish. if you have any, insert a few sentences on any local examples you have. The Plan - this is the main document which has 342 pages; it is available in printed form and digital form on the Council’s New Southwark Plan (NSP) page. neighbourhoods (headed Area Visions & Site Allocations) pages 94-342. A separate pdf for each of 15 neighbourhoods is here. The Contents Page 3-7 lists all the policies and the neighbourhoods. A copy of this is available here. 11 schedules and maps - these are all mentioned in the Plan report; the titles of the schedules and where they are referenced in the Plan report are listed here. 6 Annexes - these all form part of the NSP. The titles of the 6 Annexes are shown here. The Annexes are in a separate document on the Council’s New Southwark Plan (NSP) page. The Appendices are ‘supporting documents’. They also are listed for download on the Council’s New Southwark Plan (NSP) page. These are the dates, at 7-9pm. Details here. You can come to one or more than one session. Please email info@peckhamvision.org to reserve a place and for further information. briefing note on the EiP and soundness tests produced by the Southwark Law Centre. tips for writing representations produced by Council Planning Dept. To help in this process, we have prepared a template to use to submit comments here. This will be an acceptable alternative or complementary to the on-line form on the Council's website, as well as to keep notes of the required details. There are some key aspects that must be followed to have a good chance of your issue(s) being chosen by the Inspector for the Public Hearings and for you to be invited to speak. The template is designed to capture all this. Identify what you think should be changed, and why, in the Area Vision and/or any sites that you know, and write some text for that, and keep a careful note of the page number and NSP section number references. Bring a typed draft of this text, even if rough, with you to one or more of the drop-in sessions. We are doing a special exercise on the loss of industrial land across the borough so please note carefully which sites in your neighbourhood are losing industrial land and how much. 2. NSP DEVELOPMENT POLICIES There are 6 strategic policies (pages 3, & 16-20 in the NSP) but they cover many individual topic policies some of which interrelate. The list of Contents on Pages 3-7 show what topics are included in the detailed policies and how they are grouped. At this stage, if you have time read through the policies on pages 21-93, mark any that you have questions about or concerns or already have a view that they are not right or there are better ones. Draft your ideas and keep a careful note of the page number and NSP section number references. If you haven't time to read all the NSP policies, see if any concerns of yours fit with the topics in the NSP Contents list on pages 3-7 and look to see what the NSP says about them. People & groups - impact on and provision for existing residents, families & children, young people, older people, disabled people, mental health, equalities, gypsies & travellers. This page was last modified 00:49, 16 April 2019.